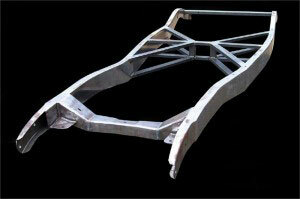 Laser Specialists Inc. offers industrial laser cutting services for the automotive industry. We utilize innovative laser cutting technologies that work with a wide range of materials. Laser Specialists specializes in low-production, pre-production and full production parts. Our professional laser cutting services help the automotive industry achieve excellent results with unbeatable efficiency. From prototype to production, we give you everything you need in laser cutting technology and support for the automotive industry. Our professional laser cutting specialists work with a variety of materials for the automotive industry to produce the automotive parts you need. Materials include carbon, mild, high strength and stainless steel, aluminum, boron, usibore, titanium, ceramic, plastic, rubber, acrylic, foam, and various textile composites. All of the materials are cut with the utmost precision and accuracy. Prototype orders typically range from 50 to 500 parts and production runs range from 1,000 to 500,000 parts per year. Prototype – low volume part runs that allow automakers to manufacture components and assemblies that will ultimately be built into a test vehicle. This phase is used to prove out designs, develop production intent manufacturing solutions and put test vehicles through rigorous crash test and safety protocols. Pre-Production – medium volume part runs required to support the ramp up or launch phase of a vehicle. Often time’s dies or production intent tooling is not yet ready; therefore, the laser serves as a versatile tool that can be programmed to cut to exact specification at a moment’s notice. Low-Volume Production – low volume production programs are often a great opportunity to investigate using laser cutting to eliminate the expensive costs associated with die cutting / hard tooling. In this phase, these programs often fall somewhere into 2,000 – 100,000 vehicle sets per year. The added benefit of using the laser at this stage is that manufacturers now have a cutting tool that can be customized on the fly to support the cutting of products that have multiple trim variations or that are expected to change over the months and years ahead. High Volume Production – high volume production part runs are sometimes achieved with the help of the laser. High strength materials like boron often require a laser cutting solution in the production phase because hard tooling is often not durable enough or extremely costly. Additionally, if there is an engineering change or recall on a vehicle component in production that requires immediate support, we can easily create a CNC program to the revised trim requirement, without the need for hard tooling. Alternately, sometimes the material characteristic of a production component completely rules out the ability to use hard tooling. In that event, the laser is a strong choice with its inherent ability to fabricate a variety of hard materials to achieve optimal cutting results (this is largely seen in hot stamping). It is extremely important for the auto market that components are produced accurately and made to design specification so they are guaranteed not to fail. Quality control is a key element of our success at Laser Specialists. We are continually refining our laser cutting systems and manufacturing processes to ensure that we not only meet but also exceed the requirements of our customers. We are committed to continuously improving our manufacturing processes to provide our customers with timely deliveries of defect-free, high-quality parts. If you have any questions about our laser cutting services for the automotive industry, please call 586-294-8830. For more information on our Michigan based laser cutting company or to discover how Laser Specialists can provide solutions specific to your industry, call us today. © Laser Specialists, Inc. All rights reserved.